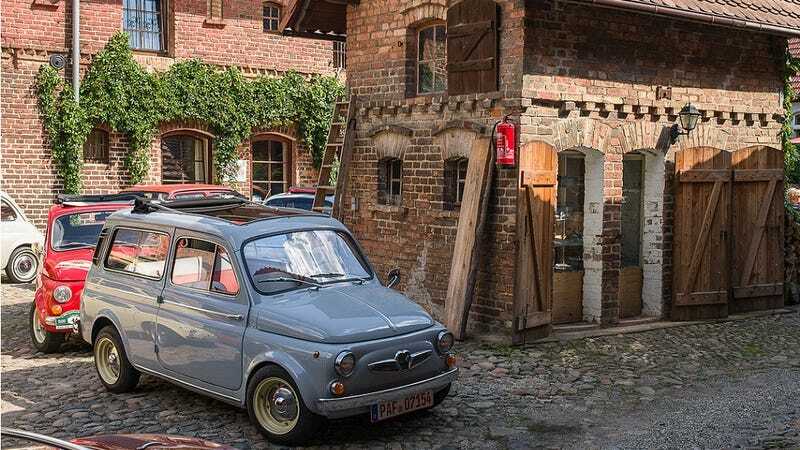 Steyr-Puch is well known for producing the G Wagen and a variety of off-road vehicles but they made some great micro cars in the 60s and 70s and made the best version of the Fiat 500 at the time. They entered into an agreement with Fiat in the 50s to provide a body for a micro car but produced their own better engines and suspensions and even competed in some racing championships of the time. The development of the Steyr-Puch micro car started in 1954 with the agreement to buy shells from Fiat. The body shell was shared with the Fiat 500 except for the custom roof and engine cover. The first Steyr-Puch 500 models featured a 493cc 2 cylinder boxer engine that was developed in house and produced 16 bhp. The rev-happy engine had a short crankshaft that was nitride treated and featured advanced head design with large valves and hemispherical combustion chambers. The engine was backed up by an advanced transmission that was synchronized and stopping power was provided by large cast aluminum drum brakes. The first versions featured suicide doors and a folding roof as well as better interior space than the Fiat variant. Since the boxer engine took up less space in the back, the rear seats were able to be installed deeper into the cabin allowing for better seating space. The Steyr-Puch model was much smoother than the Fiat model due to the better balance of the boxer motor and improved custom designed rear suspension. The next evolution of the model were the 500D and 500DL and they featured a hardtop roof along with an upgraded engine that produced over 20 bhp but was listed as 19.8 bhp to get around increased taxes. The DL version featured an early automated transmission called the Saxomat and did not have a clutch. The Saxomat was a dual clutch transmission that had a centrifugal and servo clutch. The next interesting variation was the 700C which was a wagon body style and referred to as the Combi. It featured a 25 bhp engine and a longer body based on the Fiat 500 Giardiniera. These cars were used as service vehicles and parts runners so many of them are well used up but a few survived and some of them have been upgraded like the example featured here which is powered by a 660cc engine producing 50 bhp. The 50 bhp engine comes from the 650TR II. This model was developed for racing and it featured a modified camshaft and exhaust system. The model started out as the 650T which featured the engine from 700C with some modifications. The 650T evolved into the 650TR and the addition of dual carburetor and additional modifications to the engine increased the power to 27 bhp. The most powerful version came out in 1965 and was called the 650TR II. The engine was further modified to produce 42 bhp and was able to produce up to 50 bhp when modified in the aftermarket. The TR II was a popular race vehicle as it was cheaper than comparable cars from Mini and BMW. Many wins were recorded with these little cars but the most notable is Sobieslaw Zasada winning the Group 2 touring car championship in 1966 beating out the BMC Cooper. Bozi is the founder of Hoonable.com and creates articles on everything from engine swaps to late model car restorations. You can follow him on Twitter and Facebook or drop him a line at Hoonable!